Locus classicus: Metino brdo near Kragujevac (Pancic, J. 1870, BEOU!). Holotypus: Kragujevac, Metino brdo, Pancic 3477, 1870, BEOU! Distribution in Serbia: Metino brdo near Kragujevac, from Vracevšnice toward the village of Ljuljaci. 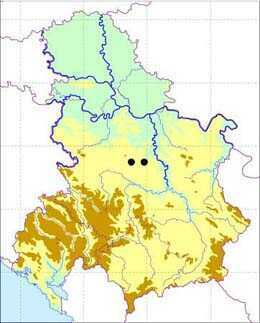 It is cited for W. Serbia in the surrounding of Bajina Bašta at the foot of Mt Tara, beside the river Derventa (Stjepanovic-Veselicic 1972:528, Gajic1988:208), but these data refer to A. officinalis. Habitat: Hedges, between farms and brushwoods, the margins of thickets, on wet spoil at 200-300 m.
Other: This species is exctint. The major cause is the extention of the town of Kragujevac. There are no possibilities of reintroduction since the taxon disappeared permanentlz from the world gene pool. Note: After Pancicthe species has never been recorded in Serbia. The most recent floral surveys in the surrounding of Kragujevac showed that this taxon does not grow any more in the locus classicus. The chromosomes were counted by Skovsted (1935) on the material grown at that time in the Botanical Garden of Copenhagen University. 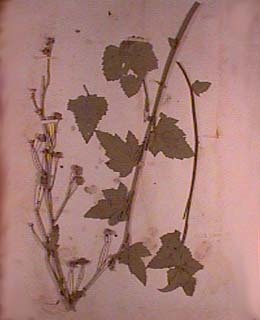 It may be concluded on account of the data from 1887 and 1961 Index seminum, that the species A. kragujevacensis was also cultivated in the Botanical Garden "Jevremovac" in Belgrade.